Deaton’s Waterfront Services is an authorized dealer for ShoreStation, Sunstream and Poly Lift boat lifts. We offer different types of boat lifts, including Stationary, floating, hydraulic, and cable. THE Age Old Story: A boat is a tremendous investment!! People whom are true boating enthusiast always enjoy being out on the water with friends and family. The calm and beauty of the water gives us memories we all will never forget. Some memories can be not so memorable if you are having to clean your boat constantly instead of relaxing in party cove. THE Ultimate Solution: There is an alternative to cleaning, sweeping, and washing your boat endlessly throughout the season, and we can assist you with this process. The History: In 1959 the first boat lift was invented. It was a simple design of using cables and pulleys to physically lift the boat out of the water and remove it from developing algae on the bottom of the hull. Such a simple idea, can be extremely beneficial to your number 1 investment; your boat. Your boat can be a pontoon, a catamaran, a bass boat, a vintage chris craft, or a new personal water craft. No matter what the size, shape, or hull material the end result is the same, to protect your investment and maximize memories. Support: Some of the premier boat lift manufacturers have given data supporting the benefits of using a boat hoist or boat lift for your watercraft. Having a clean hull can increase top end speed by 10-15%, and can increase your fuel economy by 10-15%. In 2017 a lot has revolutionized the industry with updated technologies, and materials that are available for the marine industry. National Manufacturers: EZ Dock, Shorestation, Golden Boat Lifts, Sunstream Boat Lifts, Poly Lift, Great Lakes Lifts, Shoremaster, Connect A Dock, Hydro Hoist, Air Berth, FLOE, Craft Lander, Rhino Lifts, Roto Lift, Econo Lift, Wave Armour, Air Dock, Jet Dock, Cube Dock, Roll A Dock, Hewitt Dock, Boat Hoist, Hydro Lift, Econo Hoist, and Boat Floater. All these touted companies have put serious time, effort, and research development to the fine products that are available on in 2019. As a boat and water lover, its always refreshing and exciting to see the latest and greatest products that are available for boat owners, and customers. At the end of the day it makes a good experience great. Methods for lifting have certainly changed over the last few decades. Cables and pulleys are not the only method utilized to lift a boat. Floating Lift or Pneumatic Boat Lifts have been around since 1964. Pneumatic tanks or floating hoists are popular, a lot of times the tanks are constructed from High Density Polyethlene (HDPE) which works and performs excellent in a marine environment. Fiberglass and Steel were also used in earlier generations of floating boat lifts or boat hoists. The industry standard across all markets is typically a Poly or plastic tank or tanks. The boat lift operates via a air valve controller. Controllers boxes contain a air valve, a blower motor, and then some sort of switch or remote. More air valves or blowers can be added to support more weight. Starting in the down position. This control box forces air into the tanks, the air in the tanks forces the lift to rise up and out of the water. Opening the Valve allows the air to escape and the lift to sink. Popular models of pneumatic lifts must be attached to a floating dock , so the lift can hinge into water or cantilever to down position. 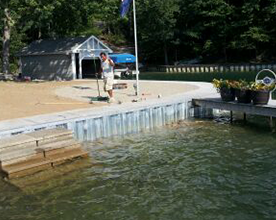 If a floating dock isn’t available we offer an “independently buoyant” floating boat lift. It can float independently without a structure to fasten to permanently. This is great for different mooring locations, or storage options. Air Berth Boat Lift, Sunstream V-Lift, or Harbor Hoist by Hydro Hoist are the leaders in this market. Floating Lifts require 36″-48″ minimum. Weight Capacities can run from 500 lbs to to 32,000 pounds. Warranties typically run from 1 year to lifetime. 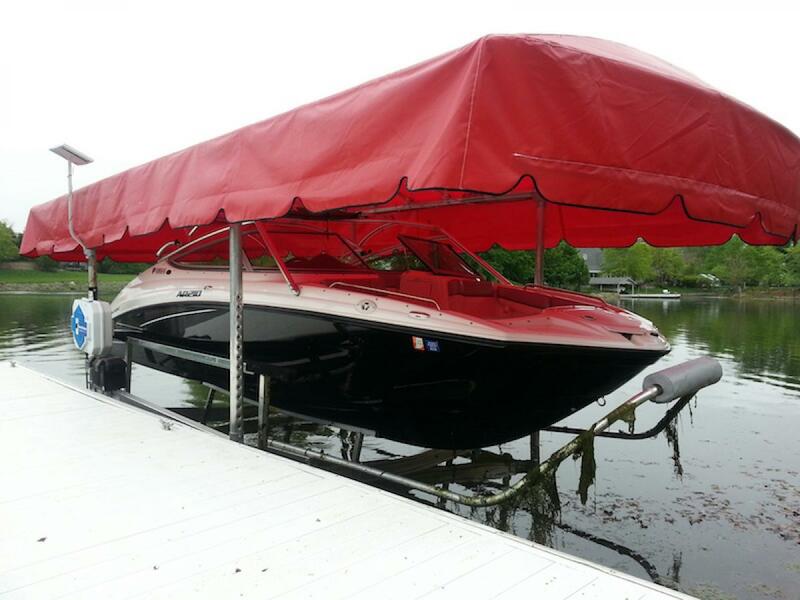 Protect your boat from harmful UV rays with a protective vinyl cover. Safely restore your boat to the original position every time you dock. With a built-in bow stop, there’s no chance of overrunning your lift. ShoreStation can vary by the owners choice. They can either be hydraulic or cable, but they are always stationary. For more information about ShoreStation lifts, visit their website here. Sunstream lifts are easy to use and compact. 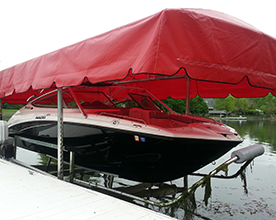 They come in either floating or stationary, allowing for customers with high water fluctuation to safely store their boat out of water. A stationary Sunstream lift is hydraulic, meaning no additional cost to prevent hand-cranking. For more information about Sunstream, click here to visit their website. Econo Lift builds great quality floating boat lifts at an affordable price. 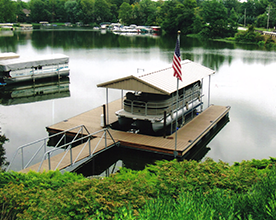 Manufactured in Lake of the Ozarks, Missouri, Econo Lift offers 100% American made boat lifts. While other lifts use re-manufactured plastic that compromises the quality of the tanks, Econo Lift produces lifts made out of the highest quality material. 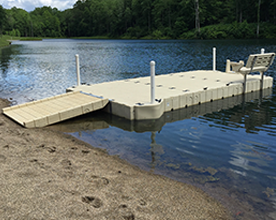 Econo Lift has recently released a new lift designed for shallow levels of water. The new shallow water boat lifts can hold up to 4,500 or 6,500 lbs. For more information about the shallow water boat lift, click here to view the brochure. To visit Econo Lift’s website, click here. 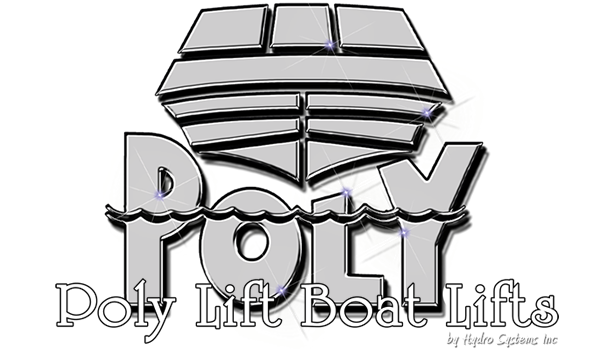 Poly Lift manufactures floating boat lifts. They come in two models, Poly Lifts or Roto Lifts. They both feature a hydraulic lift system, and come standard with a motor. Never worry about corrosion or splintering with these lifts. Your boat will be safe from zebra muscles by always being kept out of water. You can find out more information about Poly Lift by visiting their website here. If you are interested in a new lift, feel free to contact us or give us a call at (317)747-4933. Our team of experts will consult you to determine the right lift the fits your needs.